ILLUSTRATION: NOAH KROESE: Bond. 10-Year Bond. Here's the latest financial comic for Investing.com. 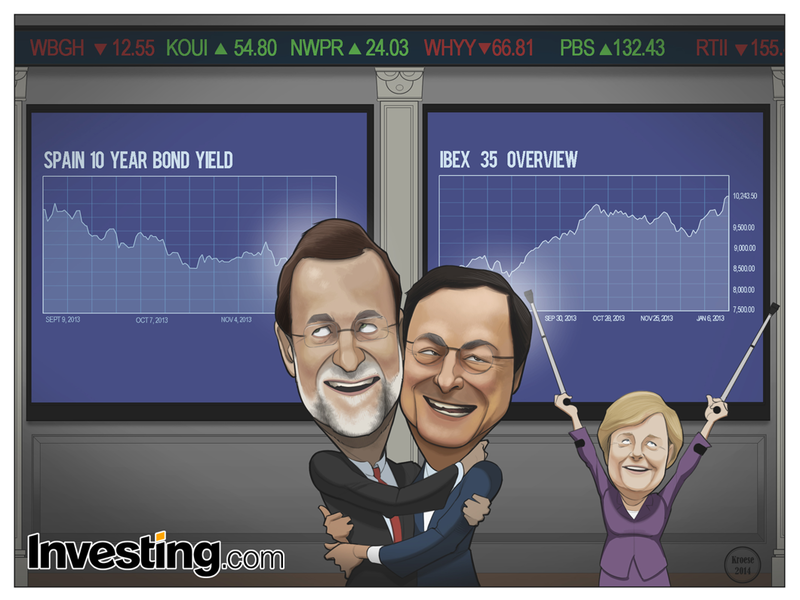 The Subject: Spain's stock market is at an all time high while it's 10-year bond yield is at an all time low. This is (apparently) good news for a country that has been in financial turmoil for a number of years. 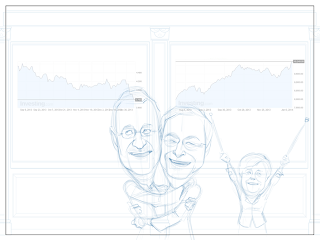 The Angle: I was asked by the folks at Investing.com to draw Mariano Rajoy (Spain's Prime Minister) and Mario Draghi (president of the European Central Bank) hugging joyfully in front of two screens showing the market and bond numbers. I was also asked to draw Angela Merkel nearby, waving her crutches in the air in celebration (Merkel recently injured herself skiing). -It's too clean. 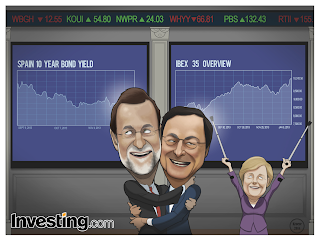 I think both Rajoy and Draghi look like they're made of plastic. I should have spent more time adding little details that made their skin and hair less uniform and more natural looking. I don't think it would have taken much (a few lines, a few spots, and some rough shading here and there). But this was one of those instances where I thought it looked pretty good at the end of the day and I overlooked the lack of texture (or at least the final treatments and details that would have made those textures and surfaces more convincing). 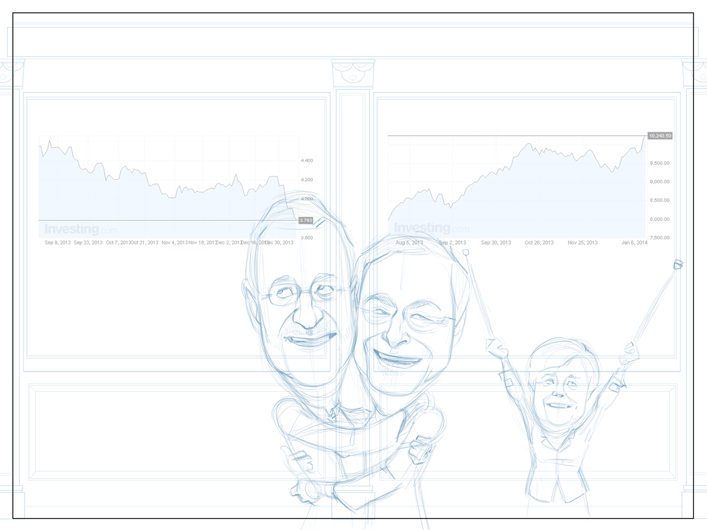 -Also, I think Draghi's face is a bit off. The caricature could have been stronger. Three out of five. Not my best work. It occurs to me that I haven't been performing well on these comics in the past several weeks (IMHO). I haven't done one in a while I thought really hit it out of the park. But I'll have another shot at it this week, so fingers crossed.